The AltAcc by Black Sky Research is a great data collection tool for rocketry but it does have one problem. It requires that the data be downloaded to a computer between flights. Most people lug around a laptop to launches in order to offload the data using the supplied proread program. I don't know about you but I have enough things to bring to launches already. In addition, I don't own a laptop so I wanted a better solution. Enter the PalmPilot. This popular PDA provides all the features necessary to implement a portable proread program. 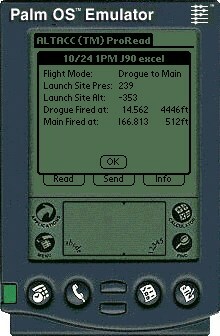 ProRead for the PalmPilot allows one to download flight data from an AltAcc and save multiple data files in memory. It will display information about the flight such as maximum altitude, velocity and acceleration. Later they can uploaded a PC using the version of proread supplied by Black Sky Research to perform full data analysis. To run Proread you will need a 3Com PalmPilot running version 2.0 or later of the OS. 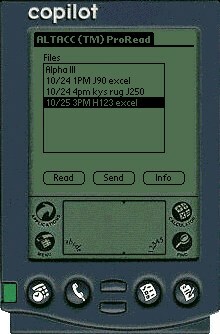 This is found on the PalmPilot Personal, PalmPilot Professional and Palm III versions. You will also require a means for connecting the AltAcc to the PalmPilot in order to download the data. There are several cabling options available. Go to the History section at the bottom of the page and download the proread.prc file. It is not compressed (it is small) and the only documentation currently is this web page. Install the proread.prc file as you would any PalmPilot Program by using the Installation Manage provided with the PalmPilot desktop Software. Using the ProRead program is very simple. To download flight data from the run ProRead, make sure the AltAcc is connected to the PalmPilot and press the [Read] button. ProRead will read the flight data and display the checksum when it is done, click OK. You will now be prompted for a filename for the flight data. You may assign up to 32 characters. To Send recorded flight data to your PC connect the PalmPilot Cradle to your PC as usual, place the PalmPilot in the cradle, choose the file you wish to send and press the [Send] button. ProRead will now wait for the PC version (supplied with the AltAcc) to read the data back to the PC. If there is no response after 15 seconds ProRead will timeout so it is best to prepare the PC to read the file, click [Send] and then press [Enter] on the PC. To Delete a file from ProRead that is no longer needed select the file and Choose Delete from the File menu. To rename a file chose Rename from the File menu. You will be prompted for a new filename. You may cancel either operation without making any changes by clicking cancel. Proread can also perform calculations on the data to give altitude and flight time information. To see how high the rocket went click the Info button. In addition to displaying the Checksum and creation date/time ProRead will also display the max pressure altitude and time to apogee. To see more detailed calculations click [More...] A sample of the Detail Screen is show at the right. In order for the calculations to be accurate you must provide ProRead with the calibration data from your AltAcc. You enter these values in the Calibration dialog on the Options menu. A set of default values are provided initially. These should be changed to the values listed in your calibration file (usually called PRODATA.CAL) which comes with the standard PC AltAcc software. You only need to select the transducer type, which for most people is the MPX4100, and enter three values. The first two values, "Actual Barometric Pressure" and "AltAcc Pressure Avg" are near the top of the calibration file. The third one, "Slope of Output", should be near the bottom. See your AltAcc manual for more information about the calibration file. Don't Own an ALTACC or PalmPilot? For those of you interested in trying out ProRead but don't own an ALTACC there is an emulator available from Palm Computing that runs on a variety of platforms. It works very well and can even use the PC's serial port to communicate with an ALTACC to download data using the data cable supplied by Black Sky Research. You will need two pieces in addition to the ProRead Software below, the emulator and a copy of the ROM images. Either ROM version 2.0 or 3.0 will work. Follow the directions for installation and then choose Install Application from the "right click" menu to load ProRead. You can get the emulator from The Palm OS Emulator Page. If you own a PalmPilot but don't own an ALTACC I have made available a PDB (Palm database file) containing several flight data files for you to experiment with. Get the Sample Flight Data here. I have made available a program called ProExt for extracting the datafiles from a backed up PalmPilot Database. You may find that using this utility is easier than using the send feature in ProRead. Click here to see a better description and to download the source code and executable. ProRead is made available for free. Please use it and give it to others as you see fit. I ask that you do not charge for it or distribute it in any modified form. Also, while ProRead has proven reliable so far I cannot be held responsible for lost flight data as a result of a program error. Due to the way the AltAcc implements its serial port there is some noise prior to sending the data which the PalmPilot seems particularly sensitive to. I have made every attempt to filter this out but you may get occasional read errors. If this happens simply try reading again. The serial I/O routines block while executing so buttons and screen controls may stop responding during uploads and downloads. Add the ability to cancel an upload or download. Provide a simple graph of pressure altitude, inertial altitude, velocity and acceleration. Added a new transducer type, Custom. This allows one to override the values for Barometric Pressure Gain and Barometric Pressure Offset from the default values. Launch site pressure can now be displayed in Orvilles (raw AltAcc units) or inches of Hg. Rearranged the info box to put the more useful information first. Added a preferences box to allow selection of the display units for acceleration, velocity and altitude. Added an air temperature entry to the calibration dialog to allow mach calculation to account for temperature. Some people reported problems installing version 0.92. I think this was due to a corrupt file. In any case it shouldn't happen with this version. Fixed a bug with the rename command. Sometimes after clearing the rename box ProRead would crash. Added pressure altitude calculations a la produce. These are available by using the info button. Fixed crash with Delete, Rename, Send and Info when selected and there are no files. Added an Info button that displays a file's creation timestamp and data checksum. Please report any problems, bugs or suggestions you may have. You may email me at robnee@robnee.com I hope this program proves useful. Enjoy!